The new instalment in popular stealth series was announced long months ago, but we haven't seen the actual Thief gameplay yet. Today the developers have decided to correct this misunderstanding and revealed an impressive trailer of the upcoming game. 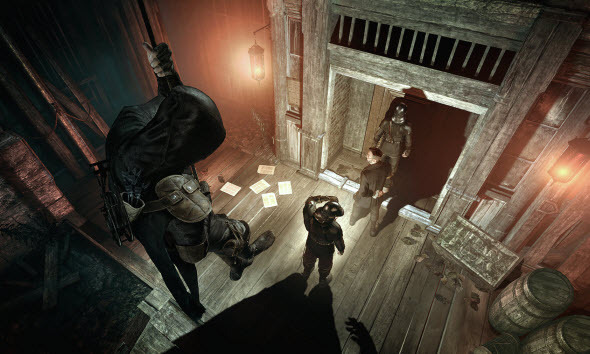 In the new Thief gameplay video you will be able to see the main stages of an average crime. First, our protagonist needs to find a potential target. Then, he should infiltrate to the house of the victim. The next stage is the most interesting, because here he steals the beautiful and expensive treasures. And the last, but very important stage - Garrett has to escape from the house and not to get caught. Maybe, this way of life sounds a little bit crazy, but in the Thief gameplay trailer the protagonist explains that previously he stole to survive, but then he survived to steal and that there is nothing better than a good challenge.